This news item was posted in Breaking News, Pakistani News, Technology category and has 0 Comments so far . Tecno, the global premier mobile phone brand with presence in over 40 countries has emerged as an impressive competitor in the Pakistani mobile market. With launch of camera and selfie centric smartphones, Tecno has put forward its vision of reaching out to the customers through new approaches of how phones could be used. Having said that Tecno has launched several devices till now that have well earned their places, despite the fact that they are facing a serious competition. While Tecno is proud of the trust that customers have shown in its smartphones, it has turned Camon series into a more vibrant high end generation of mobile with resolute of reaching at the top of market. Tecno, in the past has successfully launched several not-just-smartphones which include, but are not limited to Camon I, Camon I Air, Camon CX, Camon CX Air. Tecno has through the ordeal of its journey unequivocally adapted to the varied needs of its customers, incorporating this experience in its products. Most recently, in the continuation of its Camon Series, Tecno launched Camon X – with a vision of “Clear Selfie”, CX iteration, configuration promotion in a lower price. With a 16M clear selfie, 6 inch infinity screen with ratio of 18:9 and a face recognition feature, it has all what it takes to be a hot favorite smartphone. Camon X offers a 20M + 16M front and rear camera to being with. The image definition of both cameras has been enhanced by 30% which adds a sublime crispness in the images. A dual system of adjustable LED flash system has been offered to provide sufficient light in dim light areas. Its front camera is basically a high pixel camera which ensures clear selfies. The camera of Camon X comes with an added super pixel function; 64M super pixel through which subjects could be zoomed in without distorting the images and generating noise in it. A new generation of processor with memory color function ensures the natural color reduction. With these the device comes with a loaded variety of picture enhancement tools to boost the pictures. Bokeh effect, Super AF, Portrait HDR and recognition of 108 facial features are some of the main features. 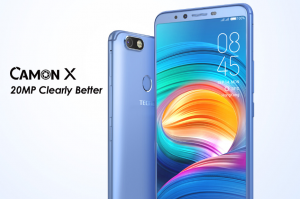 To feature more with invariable volume Camon X’s full view display screen has been re-enhanced to 6 on which 10% more could be viewed and enjoyed. The screen brightness has also been increased to 500nits from 450nits of older versions of CX and CX Air. Camon X boasts two very peculiar security features for ensuring the protection of the owner; The first being Face ID technology that can be used to unlock the phone when lighting up the screen and the other an Album Lock that is HIOS protected, giving users a double protection insurance. Using the face information Face ID brings into working the speedy 50ms recognition rate, making it more functional than the fingerprint identification feature. Camon X is powered by a 2.0 GHz Octa Core with a promoted fluency of up to 20% unlike its previous device versions which were powered with a 1.5 GHz Octa Core processor. This processor uses a HIOS 3.3 and Android 8.0 version making it a top-notch selection as the processing speed, along with its 3 GB of Ram feels like non-other. A dedicated hardware for image signal processing gives CAMON X longer battery life with fantastic photo and video capture experience. Camon X’s pool of data storage is its 16GB space that could have been extended to even more gigabytes which could have been an extravagant feast. Nevertheless it is enough space to store necessary data including documents, videos, pictures and much more. Camon X’s battery is yet another notice-worthy hardware that acts as a backbone of the system power. This power hub of Camon X has been upgraded from 3200 mAh to 3750 mAh which comes with a fast-charging function. With 10 minutes of charging users can take more than 1000 pictures. A bigger battery is what customers usually need these days. How does it feel to just hold a screen in the hand? The premimum class Camon X screen gives the users a convenience of doing more in more available space. The body of Camon X follows an ulta-thin-flat design with 5.2mm visual thickness. This ultra slim body fits right into the hands of consumers. Camon X has truly emerged as a tough competitor to high-end devices in Pakistani market. This smartphone, in a price tag of Rs 20,999 justifies its brilliant features, functions and applications. It engulfs its customers with its user friendly system and aesthetic approach of design. Camon X is easily available Midnight Black, Champagne Gold, City Blue.